With 2800 years of history — equal to the great European cities of Athens and Rome — Guangzhou, China has been an important center of culture and trade since the 9th century BC. Westerners used to know this city as Canton, and by the early 1500s it was a vital link along the Silk Road. The architecture of Guangzhou reflects its long history, with thousand year old temples competing for attention with relics of the early 20th century cultural revolution. 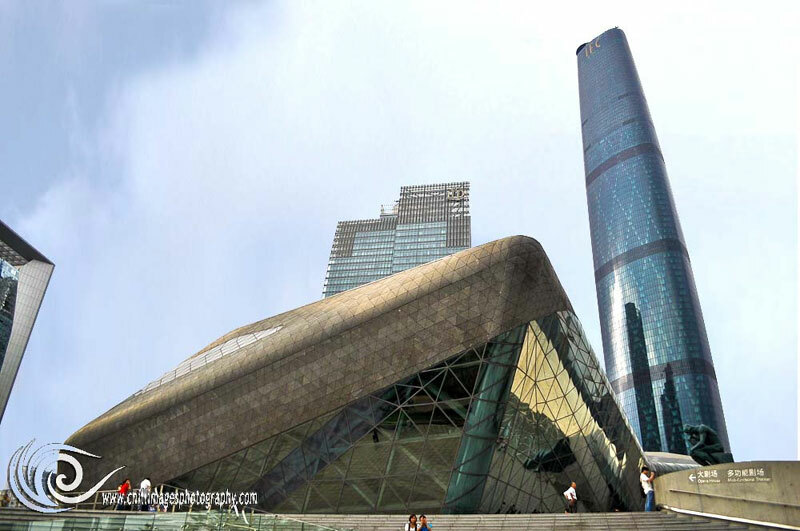 In the past few decades Guangzhou began a series of architectural projects designed to display its re-entry into international prominence. The most remarkable — and possibly the most revolutionary — addition to Guangzhou’s skyline is the stunning Opera House completed in 2010. 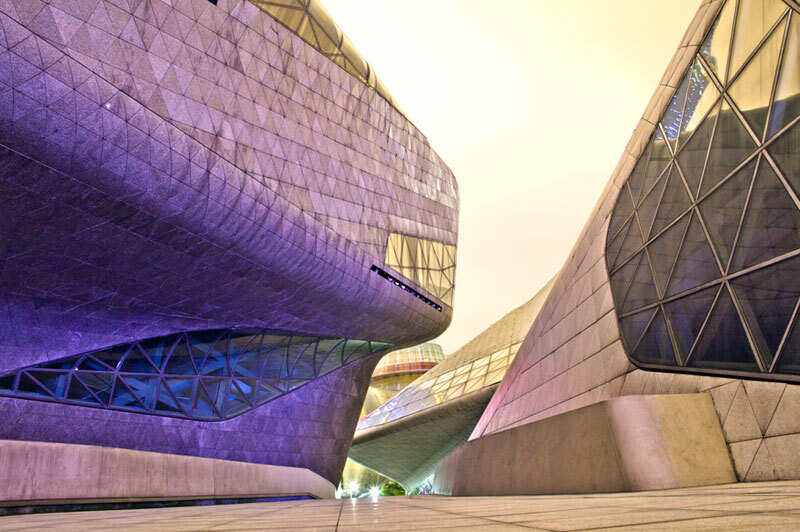 Designed by the world-famous avant garde architect Zaha Hadid, the fluid form of the Guangzhou Opera House resembles two huge boulders smoothed by the nearby waters of the Pearl River. In fact, the architect herself has described the contours of her creation as a “twin boulder” design. Already well-known for the sweeping, sculptural interiors of the buildings she creates, Hadid has taken her non-linear philosophy to the outside of this graceful structure. The curving, flowing form of the opera house brings to mind the motion of the river, and allows it to connect the river, the building itself, and the stark contemporary structures that face it across a vast green space. All around the exterior, the opera house is a labyrinth of stairways, gently curving ramps, and small pathways that spiral down into a plaza with a reflecting pool. Visitors can enter the main performance hall from the stairs, or take the ramps past the smaller of the two “boulders,” which houses a smaller performance area. The feeling of motion and energy continues from the outside right into the building’s huge curved main lobby. Balconies hug the outside of the performance hall and tremendous windows provide light and spaciousness in the day and stunning views of the city skyline at night. Once inside the performance hall, the beauty of Hadid’s design becomes clearly functional as well. The acoustics here are nearly perfect. The 1800 seats surround the stage on three sides in an asymmetrical arrangement that offers great views from any spot in the hall. And the ceiling is studded with tiny lights, which, when dimmed at the start of a performance, look like stars twinkling above in the night sky. 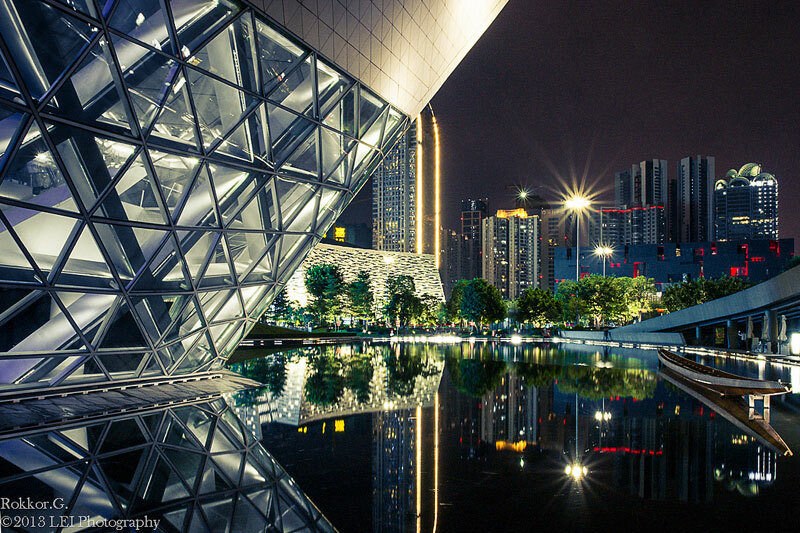 It’s hard to imagine a more perfect symbol for Guangzhou’s future. This gorgeous building brings together the elements of nature, with light and water. It has a completely futuristic feel that makes it absolutely unique. And as a public space designed for opera — which has been a popular traditional entertainment in China for centuries — it echoes the long history of this vital city. 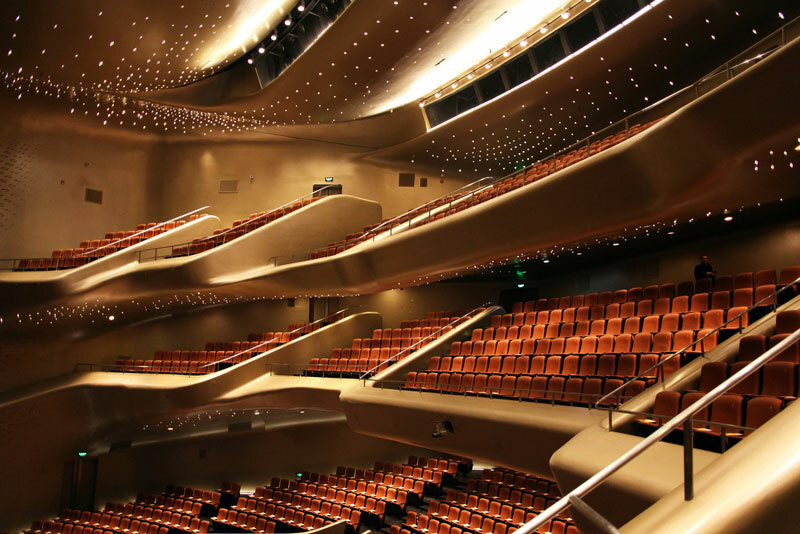 Truly an accomplishment of stunning proportion, the Guangzhou Opera House is a triumph of architecture, a remarkable display of the architect’s artistry and vision, and a breathtaking symbol of China’s new position in world politics and economics.